Elizabeth Howard’s life has been golden. The cherished daughter of loving parents, she graduated from Harvard Medical School at the top of her class, and her success as an emergency room physician promises a smooth road to the eventual assumption of her father’s position as Chief of Emergency Medicine. But then her life begins to fall apart. Her father’s death is a crushing blow, as is the fact that her mother’s Alzheimer’s is advanced enough to require moving her to a home where trained personnel can care for her. The emotional pressure of losing her family contributes to a medical decision that has tragic consequences. It is unclear whether or not Lizzie is at fault, but the hospital’s concern about litigation means that Lizzie is asked to take a leave of absence. This blow is compounded by the “suggestion” coming from her immediate supervisor, a man with whom she has been involved until a recent breakup. Without the solace of her work, Lizzie is lost. When Charlie Yang, Lizzie’s best friend, invites Lizzie to come to Jewell Cove, Maine, and cover for her during Charlie’s maternity leave, Lizzie is not enthusiastic. Charlie may love the life she has found in the picturesque coastal town (Christmas at Seashell Cottage), but to Lizzie general practice in a small town clinic seems tame after the intensity of emergency room work. Jewell Cove doesn’t seem to have much to offer outside the clinic either to someone accustomed to the benefits of city life. But Charlie is persistent, and the opportunity to be present when Charlie and Dave’s baby is born and to fill empty hours persuades Lizzie to agree to fill in for her friend. The clinic where Charlie works is owned by Josh Collins, a native of Jewell Cove. Josh was widowed when his wife Erin was killed while deployed in Afghanistan. His grief was compounded by the inescapable knowledge that his marriage had been a failure and that Erin had died still in love with Tom Arsenault, Josh’s cousin. After Erin’s death, Josh, longing for a simpler life and the warmth of family ties, returned to Jewell Cove and set up practice. Time has lessened his grief and guilt. He has even reconciled with his cousin Tom, who had also been one of his best friends since childhood. Most of the time, Josh can even be happy that Tom and Tom’s wife Abby are building a happy-ever-after life (The House on Blackberry Hill). But Josh remains leery of relationships, despite Jewell Cove’s determination to find a match for him. For now, the satisfaction he finds in his work is enough. Neither Lizzie nor Josh is looking for a long-term relationship, and even if they were looking, they would not cast a glance in one another’s direction. Josh sees in Lizzie the characteristics of a privileged upbringing that remind him of what he disliked in his late wife. Lizzie sees Josh as a surly, unpolished small-town physician. But when Lizzie is overwhelmed by her losses and needs a shoulder to cry on quite literally, Josh is there. 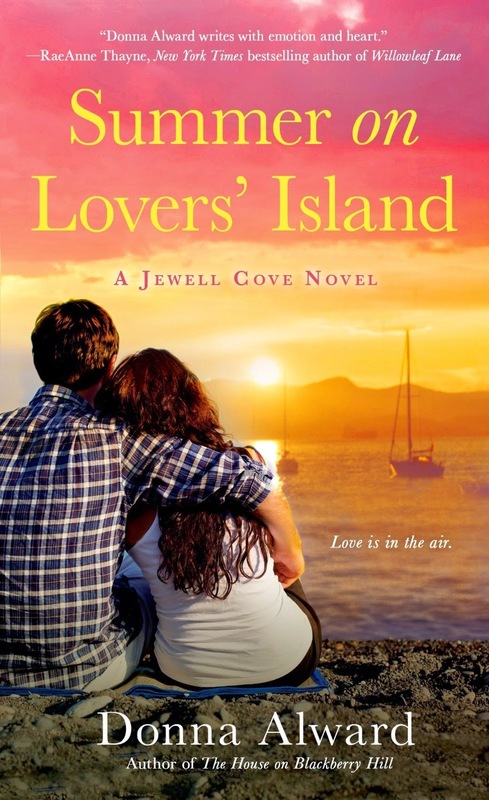 Josh discovers that Lizzie can find joy in the simple pleasures that Jewell Cove offers. Underneath surface differences, they have much in common. But can Josh risk his heart again? Can Lizzie turn her temporary stay in Jewell Cove into a lifetime commitment? Readers who like their romance contemporary and unmixed with other generic elements will enjoy this third novel in Donna Alward’s Jewell Cove series. The focus is on the developing relationship between Lizzie and Josh, both of whom carry some heavy baggage and a determination to be self-sufficient. Although the author gives readers glimpses of characters from earlier Jewell Cove books and allows them to witness the birth of Charlie and Dave’s child, nothing distracts from what is happening between Josh and Lizzie. Readers will take this flawed twosome to their hearts and root for them to find healing and happiness. Readers who have followed the series will be particularly happy to see the troubled Josh finally put his unhappy past behind him and find someone who loves him wholeheartedly. I fell in love with the Jewell Cove series with the first book, and I have found the same emotional satisfaction in each subsequent book. Alward gives her readers multi-dimensional characters who are so real they feel like friends and a community with heart and credibility. If you like contemporary romance that offers memorable characters and a small town that beckons like home, I recommend you give this series a try. Summer on Lovers’ Island can be read as a standalone. However, I warn you, reading it may send you searching for the other stories in the series. I really need to start reading this series. Thanks for the review, Janga! I bought this one over the weekend...I love her books. I enjoy her writing too. Need to pick this one up. This sounds like my cup of tea. Gonna check it out. Thanks for the great review. Hope you enjoy it, Trish! I've only read a few of her category romances . I will look for her Jewell Cove series.